Well, I didn’t manage to get back to the Rock Pool as planned due to other things going on – mainly the need to get the kitchen re-decorated really and still in the midst of doing that. Also I’m not going to manage to be out again now until Wednesday April 2nd at the earliest and so will miss getting out before the end of ‘my personal’ pike season which I observe to run from 1st October until 31st March. Anyway, my better half is away for a week from Wednesday 2nd until Wednesday 9th and so I’m planning on having a free week away from chores, etc myself and spending most of my time at the water’s edge. 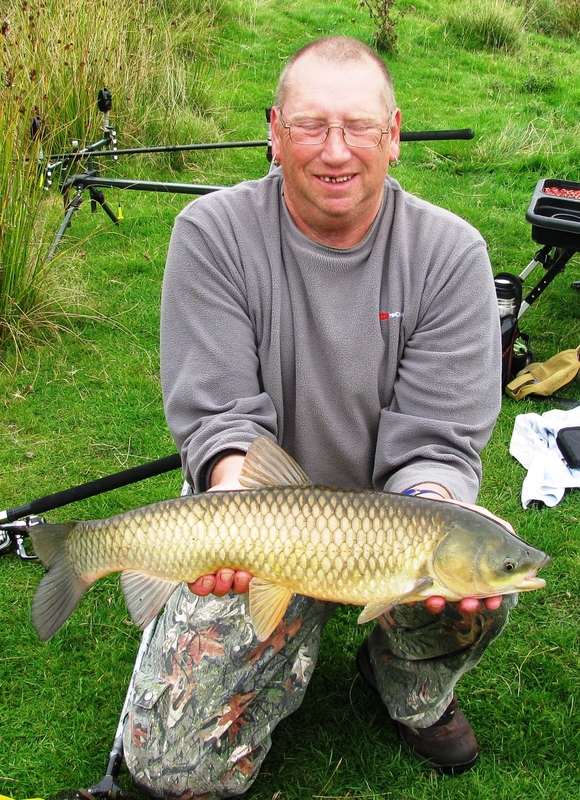 My first point of call will be made on Wednesday the 2nd at one of our club pools that contains grass carp…. Later in the week trips are planned to 3 other different club waters plus possibly 2 trips to day ticket ones. Later in the month, Sunday 13th April is the first of the club’s planned annual working party days – and I’ve bought a Stihl strimmer from a local auction to help iun that. Last year I was relegated to using a old-fashioned scythe like the on often depicted in stereotypical images of ‘Death’… and it was a very inefficient and back-breaking device and so to try to avoid that I’ve bought this strimmer. However, for the same reasons given as I started this post with, I’ve not actually got round to trying it out yet… so all is a bit fingers crossed on that especially as it cost me the best part of £100 to start with! So for me, the next few days will be spent doing as mush as possible in the kitchen plus sorting out tackle and getting food for fishing days together – plus boiling up hemp, etc, locating a decent source of maggots as my previous supplier no longer exists and buying them, worm digging and all the other usual bait sourcing and prep. 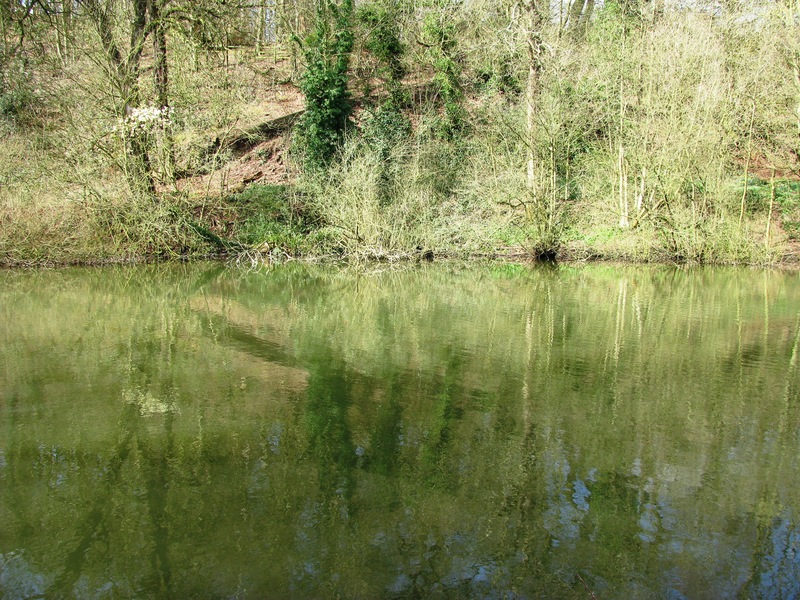 Monday, 17th March 2014, and I’m on the bank of Rock Pool at Himley Hall. 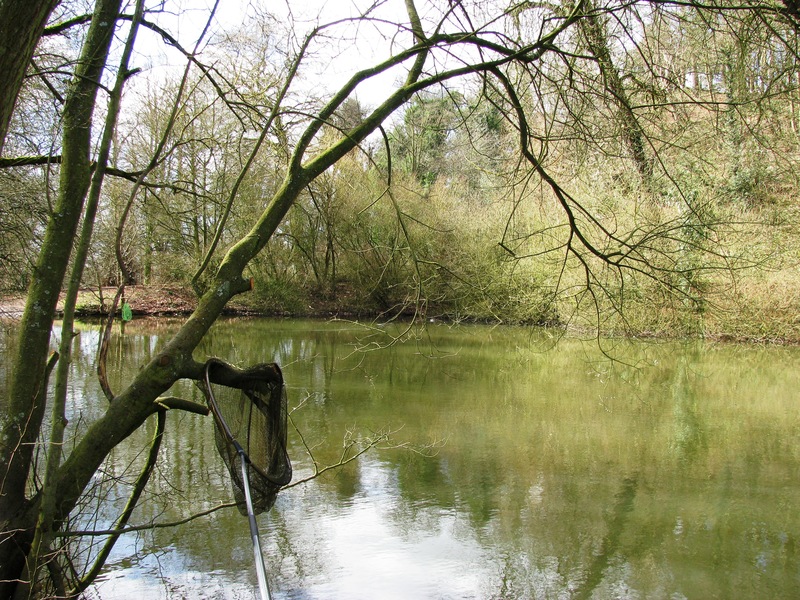 This is the smaller of the two fishing pools on the site, the other pool being the Great Pool, and this pool has only just become available to fish again within the last month. Back in the 80’s it was a trout pool and was fly fishing only. 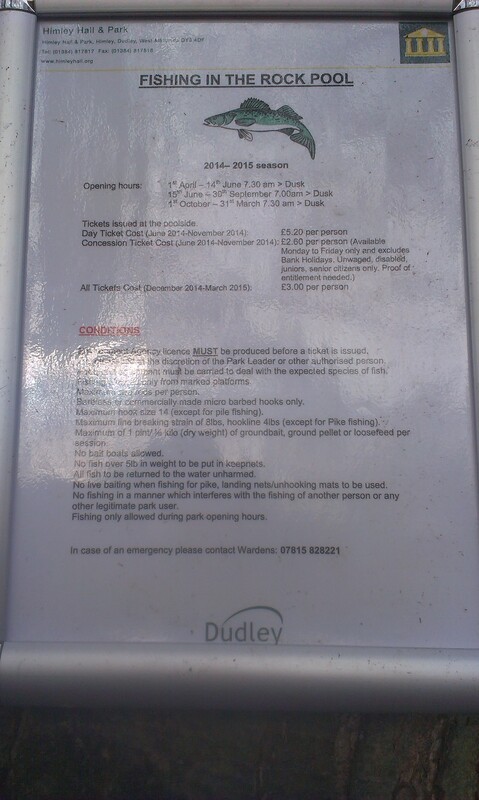 It was closed to all fishing in 1987 and re-opened, as I said, about a month ago as a coarse fishing pool. The stock of the pool is unknown but it seems, based on reports of catches I’ve heard of, that there are roach to 1.5lb, pike over 10lb, and perch. There are only 5 fishing pegs available, on a 50 yard stretch of the roadside bank, with parking adjacent so tackle transport is easy, and all pegs are platformed – how good facility is depends on whether you use a seat with accessory fittings, etc otherwise you need long banksticks for the rod rests, etc – which I luckily (well, not really – well planned) carry in my kit anyway. There are no fittings on the platforms for stand-alone banksticks, etc so you need to place them into the water/ground alongside and the platforms are 2’-3’ above water level at the edge. OK, so I fished the middle of the pegs, and was the only angler on the pool all day, fishing from 0800 to 1630. 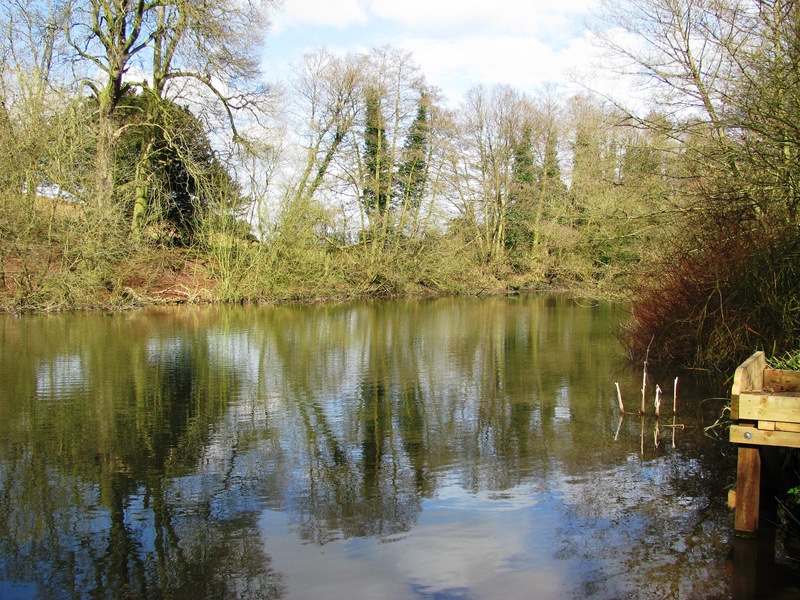 There are a few rules that apply to this pool – amongst them being a max hook size of 14, max mainline strength of 8lb and a max hooklength strength of 4lb – but these do NOT apply when pike fishing. It seems that keepnets are allowed too BUT fish over 5lb cannot be placed in such. Below are a few pics of the pool taken from my peg ……..
Before fishing I used my depth finder and discovered the depth to be a fairly constant 4’ 6” all around after a slow drop away from the edge so I elected to fish about 3-4 rod lengths out and catapulted a few particles and dead maggots into my swim before tackling up my float rod to fish laying on style, fishing 6lb line, 4lb hooklength and size 14 hook throughout the day. Baits used were worm, bread and prawn used in conjunction with various dips. AND….AND….AND…. as the title of this posting suggests…. not only did I have bites BUT I also caught fish!! 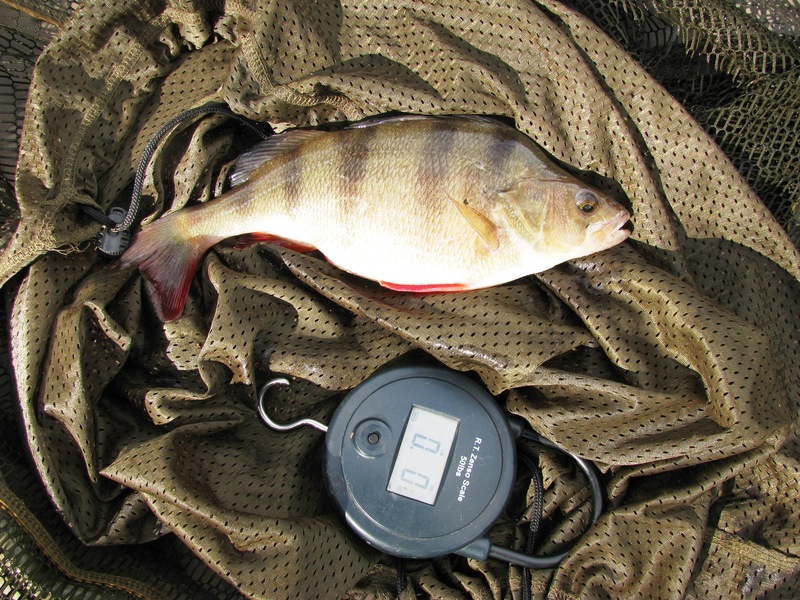 OK, not major sized – one roach around 6oz and a chunky perch that looked the size of perhaps a 10oz’er but was really broad across the shoulders and weighed in at 14oz. Also lost another roach of around 4-6oz when the hook lost hold. Also had quite a few lifts that I was unable to connect with. All bites came on worm with not a touch on bread or prawn even with ‘chopped worm’ dip and others applied to them. Throughout the day there were quite a number of ‘fry scatters’ around the pool suggesting predator activity – and the ranger, when collecting the ticket money, said that quite a few pike had been caught during the previous week. Other than that I didn’t see much suggestion of large fish bow-waving although a good number of times bubble clusters appeared – and one appeared just off the left of my platform followed by a sizeable tail swirl pattern in the water. Anyway, it was a pleasant day – air temps started at 10C, and reached a peak of just over 15C. Water temps were excellent, starting at 9.9C and rising to 11.2C over the course of the day. No Fishing – Not A Command But Has Been My Status For A While…. It’s now March 15th – the first day of the closed river fishing season – so I’ll be unable to fish flowing water until the season re-opens on June 16th. It used to be like that for all waters including pools and canals but sometime between my stopping fishing in the late 80’s and restarting in January 2011 the laws changed and now stillwaters are generally legally fishable all year round – although there are exceptions which are (a) waters that have a SSI classification (Site of Scientific Interest) and (b) waters that the owners of apply their own close seasons to (eg National Trust owned waters and some club waters mainly). However, today I sorted my tackle out and I’m now planning a visit to a local day ticket pool on Monday. The pool was closed to fishing in 1987 (was a trout fishing pool at that time) and has only just been re-opened as a coarse fishing pool. The stock of the pool is still to be ascertained but plenty of perch and roach and at least one 10lb+ pike has been caught there so far. Anyway, having a rest from the pike despite there only being two weeks of ‘personal’ pike season left (no legal close season but I only pike fish October 1st to March 31st for personal reasons) and intend to target the perch population mainly – so tomorrow (Sunday) I’ll be sorting out baits which will include digging worms (a premier perch bait), and will also be taking dead maggots, prawns and mussels. And probably also take bread and processed meat (luncheon/bacon grill/chopped ham with pork type). Also a good selection of flavour dips (bloodworm, chopped worm, monster crab, strawberry, etc). Planning on fishing the float, at least initially, but will also take my 2 leger rods and rodpod/bobbins/alarms to change to if I fancy, or need, to. Also planning on making a new batch of cheesepaste up tomorrow, ready for the new river season in June. Basically, the standard mix consists of shortcrust pastry with extra mature cheddar plus parmesan plus danish blue/stilton/similar with a small amount of marge/spread to ensure it remains soft in cold waters but I’ll also make a few flavoured variants too – (a) with Marmite (b) with tumeric (c) with chilli. I’ll also create different coloured versions of some of those (yellow/red/green). So that’s the and of this entry to the blog and hopefully the next entry will be made on the evening of Monday 17th on my return – but if not then asap afterwards. Just hoping for a catch, no matter how big or small!! Had 12 blanks in succession as documented in the previous entries – and could do without making it as baker’s dozen or unlucky 13!! Session 10 – It’s A Dozen – Nothing Changes…. So Liz and I ventured out from the house at 0800 in search of pike at the usual pool. And that was the first bad choice… hit all the school/works traffic and probably doubled our usual journey time. Also the paths are still very muddy and drawing an angling barrow with two lots of kit on board was hard work especially across the car park area. Having to park at the far end of the car park away from the pool due to the area being dug up by the lorries, etc that access the area also means that besides being boggy it is also the maximum distance to pull and over large lorry tyre ruts. Anyway, we didn’t actually get baits into the water until 1000 – despite the pool being normally 30 mins from home. As I said, the target species of the day were pike… and we both fished two rods with deadbaits, each fishing one rod with a pop-up sardine fished head down between 3” and 12” from the bottom and the other rod with a half deadbait – Liz fished a tail half herring, myself a tail half trout. Baits were twitched and re-cast several times over the next couple of hours to no avail… although I did have a few beeps from the bite alarm a couple of times as seemingly carp swam into the line but as on inspection of the baits nothing was noticeable… and at 1230 we packed down our bait rods and set up the lure rods for an hour’s lure fishing, fishing several swims on our way back to the car park. Myself I fished a 19cm/52g Savage Gear Fungus Roach soft 4Play lure in a red scull lip, Liz tried a couple of small hard plugs. Results per usual – not a touch or hint of any attention from Mr Lucius at all. We left the water at around 1400 and headed home, stopping off at our local “Belly Buster” café for a well received hot butty and a cold glass of milk. Weather on the day was reasonable – air rose from 7C up to around 13.5C by 1100 but then as the sky clouded the temp dipped and moved around in the 8C-10C band – and the freshening breeze was cool. Water temps was a reasonable 6.3C-6.5C. Plans for the future – not too sure about the next week or so – I need to sort out redecorating the kitchen, already stripped the top layer of paper off but need to remove the old backing paper. Also paint to be stripped from the ceiling, and sticky backed wood effect plastic to be stripped from drawers and cupboard doors – and then the whole lot re-painted – and I want to get this done before the end of March. Also need to visit doctor later this week, get car MOT’ed and taxed, and several other jobs sorted – so I might have a fortnight off the water – but hopefully I’ll find a way to manage to get one trip in though. The Beginning Of A New Year’s Blogging…. It is now 1st March 2014 and time to start a new year’s recording of my angling exploits. In essence the online blog will just continue remorselessly onwards, in an unbroken series of postings… but I also maintain a .DOC file version as an annual archive and its now time for the closing of the March 2013-February 2014 edition and the start of the March 2014–February 2015 edition… and this will constitute the first posting in it. Looking back, 2013-2014 has been a reasonable season – some reasonable catches, a few new species caught, a few new Personal Bests recorded – despite the dearth of results (blanks with only a very few ‘almosts’) on the last 11 trips. But as they say, ‘Onwards and Upwards!’ and a new start is imminent. Liz also had a good year although she’s not managed to get out much in the last few months. Last night was my club’s (AA) AGM… we’re giving up (well, trying to sell as we own the rights) a stretch of river that is (a) little fished and (b) unfishable due to the state of the banks and the local council is not providing help to make it usable at all. We had a chance of acquiring a new stillwater (reportedly an excellent water too) but finances weren’t in place at the time to be able to do so… hopefully with the sale of the river we will have a fund to do so for the next time one becomes available and the club is building a contingency fund for the future. Another water was also looked into – but at £250,000, well J Anyway, as usual the night’s free buffet was excellent and good to catch up with a few people. OK, plans…. On Monday 3rd March, Liz and I are proposing to have a piking session at the usual pool. I’m determined to catch a pike this season – and it would be good to catch it for the first of the new year’s blogs!! The End Of A Year’s Blogging…. Well, I started this blog at the start of March 2013 and it is now March 2014 so 12 months have now passed by – and this is the final entry in the hard copy (.PDF) version that I keep as an archive. The online blog obviously continues onward in its normal way – serene and undisturbed…….